Speeding up the construction process through collaboration and teamwork within a constrained budget – how do you do that? CEW's Exemplar programme is all about improvement, identifying and evidencing good practice and sharing it across the industry. The event showcasing the new Rail Training Centre of Excellence at Nantgarw is a perfect example. At first glance you might think what can a railway based project do to educate Welsh construction? But it represents a huge opportunity for the Welsh built environment in the form of work and the opportunity to learn about best practice. 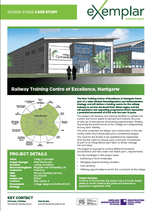 Nantgarw forms part of a wider Estates Reconfiguration and Rationalisation strategy and will deliver a training centre for the railway industry to service the South East Wales region and the rail expansion and upgrading programme which represents a potential investment of £10b over the next 10 years. The project will develop new training facilities to address the current and future needs of learners and improve the post 16 take up of educational and training opportunities, thereby improving the performance of the College and safeguarding its long term viability. The work comprises of the design and construction of the new facility within short timescales and a constrained budget. The need for the facility to be operational by September 2015 led the Client to require early contractor involvement as part of an integrated project team to better manage risk and value. The project is required to achieve BREEAM Excellent accreditation and falls under new Welsh Part L requirements. You can find out about the way the team overcame the challenges by accessing the presentation and project details via this link.